First, can I just say this is the cutest blog design...from the polka dot sidebars to the banner and the button...I just love it! I was so excited to put up a post with my ideas for my blocks...'cause that meant I got to post on this cute blog! Either today or Monday everyone should be receiving some Moda Bella White (9900-97) and two fat eighths of Happy Mochi Yum Yum. A fat quarter bundle of this line was my first purchase at Sample Spree last spring market...and I've been wanting to make a fun summer quilt with these fabrics ever since! I thought I'd give answers to the questions Amy Smart e-mailed us...and then give a couple more ideas for inspiration. Can your partners use any of his/her own stash fabric to use in your quilt block? If so, are there any limitations? 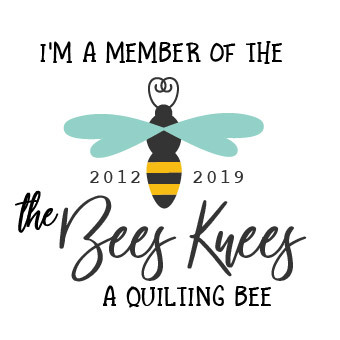 I would love for everyone to add something in...I think this is what will make the Bee a lot of fun...personalization from all the members! Is there a specific color of thread (white/off white) you want your partners to sew with? This one is up to you! Does your partners have to use at least a little bit of every fabric you send or can your partners decide? I would really like both of the Happy Mochi Yum Yum prints used in the block. Do you have a general theme or is it up to your partners to decide? Are there any specific themes that you do NOT want in your quilt block? Likes/dislikes? See Below. Will you allow any embellishments on the quilt block (i.e. embroidery, raised items such as yo-yos or fabric origami)? No embellishments, please...all pieced...thank you! Can you link us to any flickr or Pinterest photos that you would like us to use as inspiration for your quilt block? A few links are below. If your partners are super motivated and are able to make two blocks out of the fabric you send, would you accept more than one block from your partners? Sure...I'm planning on a 16 block quilt--but please don't feel like you have to make anything extra...I know how busy everyone is! Do you want your partners to return any leftover larger size scraps to you when they return the completed blocks or can they keep them for their own scrap stash? No...please keep the scraps to add to your stash! Okay...so here are just a few other ideas...I love stars and pinwheels and log cabins and houses... here are a few links that I had saved in my inspiration file as well. Thanks so much...I look forward to getting to know everyone...and to making blocks each month! Oh I LOVE that fabric! I have a fat quarter bundle of it as well from Market! I love Monica's fabric designs. She's super fun and I know this is going to be a fun quilt. I'm looking at the blocks and I think I love Freshly Pieced more...but we will see. :) Can't wait to see your finished quilt! Yay, Sherri! I got my fabric just now! This is going to be such a sunny quilt (I love this line too.) I'm excited to see what everyone makes! Got your yummy fabric! Makes me happy and giddy as can be! Boy-ya! I can't wait to get to my mail box today! I love the fabrics and love the idea that this will be a bright and fun quilt! The links you provided are from a BOM that I have on my wish list to tackle someday... some very fun things here... nice way to get the ball rolling Sherri!!! Such great bright prints, this is going to be such a happy quilt! I am so jealous & would love to get involved! my very first bee block.